As I had previously posted, one of the several books I am working my way through is James Martin’s The Meaning of the 21st Century and I am finding it a fantastic thought provoker. Most of his book is spent talking about solutions to the problems we face in the current Generation and offering clear vision to how to implement them, but several of his portraits of the mid near future (say 25-50 years out) are dark. He calls it The Canyon. Those of us familiar with the The Natural Step would term it the Resource Funnel. The funnel is currently closing as the demand for resources rises and the availability of resources (including such vital things as clean water and topsoil, not just oil and n. gas…). It is most often depicted as it is at right: with the lines not touching. Basically that The World wakes up before it gets ugly. The reality is that when we are approached with a slowing growing, easily rationalized or otherwise nebulous threat we typically do nothing until the crisis occurs and removes all doubt. Two easy, recent examples would be the Cod Fishery off Newfoundland, and Hurricane Katrina. In both cases scientists, engineers and enlightened citizens decried the impending doom or either a collapsing fishery or blown levies, but in each case enough smoke was blown to forestall action until the Crisis Hit. Then in the case of the fishery at least massive legislation was instituted. Each of these cases were avoidable, the science to correct them known, and an early fix would have been immensely cheaper then correcting from the Crisis. These cases were also regional and for the most part only involving one country. Take the case of Global Warming, Peak Oil, or Global Population, and I am in my darker moments I am forced to the conclusion that we will not, perhaps cannot, react until it is far too late-until after the Crisis. Martin’s Triage scenario fits my vision when I am that dark. Triage is a way to assess those who are in need of medical attention after an extreme event-when the victims are far in excess of the medical providers resources to handle them. Triage is a way to roughly and callously (realistically?) group the victims by the ability to be treated to attempt to save the most victims possible without wasting precious effort on the Doomed. When we enter Martin’s Canyon, or when we let the sides of the funnel cross, we will be undergoing a Crisis that could very well force the planet’s nations into Triage. The 1st world will be shaken and bloody, but will almost certainly survive-America did not see mass starvation even in the Depression. The rate of survival without disability will fall quickly as you enter the 2nd world, and by the time you reach the 4th world-where people are already starving-there will simply not be resources left to feed them all. The 1st world has the money to buy the food, regardless of cost. Hell, we even use food to power our cars. This scenario can be avoided with current technology, the scientific community-even the oil engineers-are telling us it is coming. And yet we will most likely do nothing until the cod runs out. 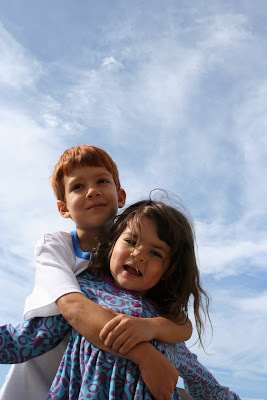 I usually don’t go this Doom and Gloom-neither here in the Blog nor in my actual life. But this morning I was at my son’s school. In the hallway after the assembly there was one of Sprout’s classmates that is in a mechanized wheelchair and is very severely handicapped. Again, I am in a Dark place now, but when I got home I wept. When Triage hits the 1st world civilization will survive, but there are many shades within even our uber affluent society. I have made it a mission to learn what is necessary to be able to feed my family, even my neighbors, once it Gets Bad. But how will this boy, or the thousands like him, manage? I had hoped to have a litany of informative pictures in place to detail my mid fall planting, but the camera went on the fritz-another issue with being 10 miles from home. Without pictures to prove it, you wil have to take my word for it: I had a very productive afternoon! Last Monday I finished prepping the beds, but there was still the little item of getting the house over said beds. I brought along my 5′ steel prybar and we rummaged around to find some “rollers” to help us out. 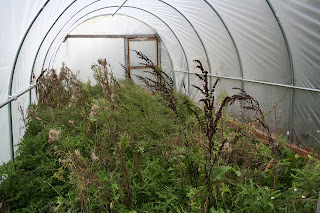 The thought being we would lift up the greenhouse with the prybars, put some rollers under it and then push the Hoop House onto the prepared beds 25′ to the south. We found some old fence posts and got out a chain saw to hack them up into 6 18″ chunks. We also came across some planking which we put under the rollers to make it easier. The 5′ prybars made short work of the lifting with proper fulcrums and once on the rollers, the whole apparatus pushed quite well-the only exception being that we drifted East repeatedly on the uneven ground. 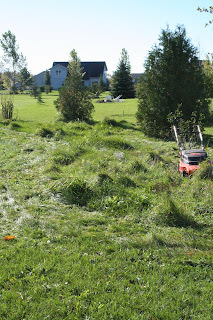 Some redirection with the prybars and we had the house moved all 25′ in about 3o minutes-without using a tractor! The owner had said he “might even have some seeds” when I proposed planting some winter greens. He wasn’t kidding! 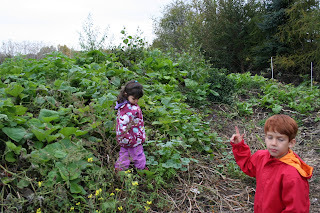 In 2005 the property had hosted a 25 family CSA-and it turns out that the left over seeds are all still there! One of the most beautiful things about CSA’s is the diversity of the produce, which is necessary to provide a half bushel of produce to each family-every week for 20 weeks. “Some seeds” turned out to be 2 5 gallon buckets of commercial size seed packets from Fed-Co Seeds. The CSA really drove the variety of cultivars-I found 5 varieties of spinach alone-many in 8-16oz packets. I think I could plant 3 acres in spinach alone! Between this stash, and E4’s bounty I am set for next year with the exception of dry beans, seed potatoes and some tomato varieties that I am finicky about. For a planting this late I set a strict limit of veggies that are harvest able from direct seed within 50 days. Given the short day factor of fall planting, I figure a 30% addition on that. This limited the planting to, well, about what Eliot Coleman recommends in Four Season Harvest. In the buckets I found (in addition to the spinach) mache, black radish, claytonia, bok choy, and arugula. Even these stalwart plants should have been in the ground 2-4 weeks ago, but I am giving it a go anyhow. I have dreamed of what I could accomplish in time savings by stepping up to “commercial” grade tools. The owners had 3 Earthways hanging in the shed, with another 3 tied together to plant 3 rows simultaneously. I was excited to try it, but the reality completely blew me away. What an elegant tool!! 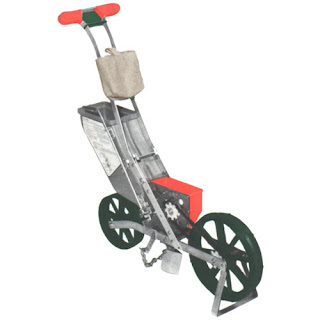 Assuming you have a prepared bed, in one pass the seeder cuts a furrow, plants a seed to the spacing you have chosen in the planting wheel (10 sizes on site), fills in the furrow with the dragged chain, and then lightly tamps the soil over the seed with the rear wheel. Dear god is this easy!! Even planting 6 different varieties, I had both beds planted in 15 minutes. The tool is so simple and easy to push that my 5 year old literally seeded two rows himself. Wow, wow, WOW! These seeders are available new for $110 and if you plant more than a few beds it is worth every penny in time and back pain saved. I planted the beds with 3x the seed needed-with the low temps and 2-3 year old seed I want to hedge my bets. 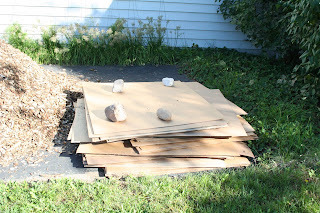 I then soaked the beds thoroughly, and drenched the wood chip paths with the intent of getting a significant amount of moisture into the house before I close it up for the week-given the temps I am not worried about mold. This week I would like to purchase a thermometer that will allow me to tract high and low temps to see how much benefit the hoop house is netting me, and help me to determine if/when I need to add the cold frames. Fingers crossed that I get germination in week 1! 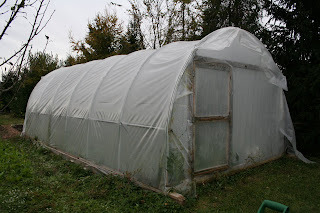 One of the seemingly unending perks of the partnership with the local hobby farmer is that he has a small (12’x25′) hoop house that is currently sitting unused. 2 weeks ago I proposed the idea of prepping some beds for some winter greens. As the owner was very enthusiastic, and even has the seeds on hand, we are giving it a go. The plot and hoop house have been unused for 2 years, so I have my work cut out for me. Still, the tools on hand are fantastic, and make the task less daunting. Plus a excuse to get dirty in the crisp October air is most welcome! 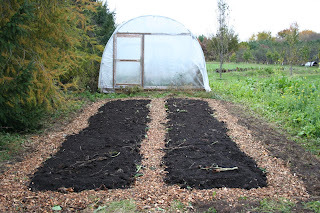 The owner has a 48″ PTO driven rototiller so we cut 2 beds to the south of the Hoop House. The house is on 4×4 skids so once the beds are prepped we will put the house on some log rollers and drag the it over the prepped ground ala Eliot Coleman. 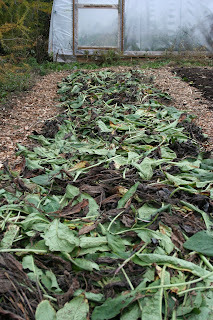 This weekend I discovered a large patch of Russian Comfrey (one of my all time favorite plants) that was overgrown and got permission to cut it down for soil prep. 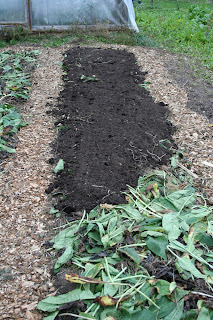 Here is a shot of a 3×25′ bed filled with .5 cu yards of comfrey cuttings (high in minerals and a great soil builder) and lined with a 1′ wood chip path. The soil is so friable that you sink 2″ into the tilled ground without it! On another part of the property there are 3 windrows of 3yr old leaf mold of extreme proportions: 6′ tall, 12′ wide and 75 yards long! This past year, another family grew squash and cherry tomatoes on them (below), next year I will most likely put potatoes on one of them. 500 yards of compost anyone? 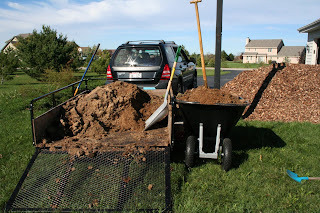 The compost is about 200 yards from the hoop house, but 5 trips with Archimedes (my 10 cu ft barrow) and I had enough to cover the comfrey with a 2″ layer to coax the worms to the feast. Rain was starting and the temps were dipping into the 40’s so it was none to soon when the last load was raked flat. 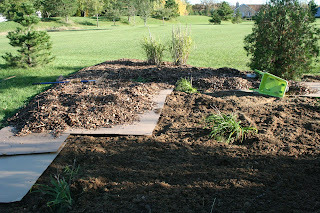 The beds will rest until this weekend when a few friends and I will attempt to move the hoop house over the beds. The owner assures me that 4 guys can lift it, I think we’ll need the tractor. Regardless it will soon reside over the now finished beds. 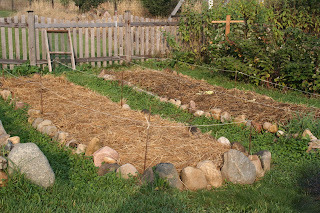 The beds are gorgeous, and in the 2-3 weeks it will take for us to move the Hoop House, plant and get the seeds to germinate, the comfrey should be mostly worm manure. Next year we will start a month earlier and have transplants on hand to give us a jump. Given how late we are starting, I give us a 50-50 chance of actually getting edible greens this season, but the learnings will be legion. Time to order a Scythe! This weekend the air finally turned crisp-we had our 2nd frost of the season-and it was time for the vegetable gardens to come down. The crazy thing about it was that I picked another gallon of green peppers, and another 20lbs of tomatoes-on Oct 13. We lost track of our total harvest when our harddrive crashed this past week, but total take was in the 4-500lb range -with an incredible 50 lbs of that being romaine. With the sunchokes yet to come in 500lbs will be a sure thing. We delivered the last load of lettuce to the coffee shop, pulled up the remaining beets, cilantro, and carrots and then reached for the scuffle hoe and hand kama to prepare the beds for winter. Once the tomato vines were down, I then ran my electric mulching mower through it to chop it up into itty tiny bits for the critters to eat. Having read Ruth Stout this past year , there can be only one thing to do next: I layered on one small square bale of straw per 80 sq ft bed. 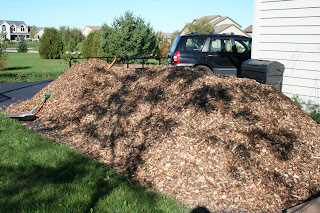 This may not be thick enough as it is only about 2″ deep, but total mulch including the green matter is about 3-4″. I am an incredibly firm believer in the philosophy that we need to start thinking of ourselves as Soil Farmers, i.e. as sustainable growers we must cultivate the health of our soils to produce healthy pest free crops. My soil was dirt when I started-clay, sand and cobblestone sized rocks that the developer trucked in froi ma nearby quarry-organic matter content was in the fractions of a percent. My answer has been to double dig in about 2 yards of compost per 100 sq feet of bed to start, and then add organic matter yearly for the past 2 years. 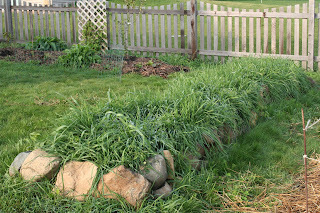 This past Spring I needed to take some severe anti Quack grass measures and meticulously turned and hand pulled rhizomes to attempt to rid my gardens of this plant (Quack Grass is about the only plant I term a “weed” in my gardens). But hopefully that will be the last major disturbance the beds will see. 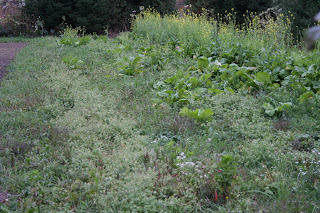 Going forward I hope to no till them and use heavy mulches and a cover crop rotation to keep organic matter and soil life high, and invasive weeds down. I added 3 new beds this year for the purpose of keeping 4 beds in production and allowing the remaining 3 to set in cover crop for a season to rebuild. The more I read about cover cropping the better I like it. Historically, and by that I mean 60-70 years ago, farmers would use cover crop mixes with upwards of 30 different plants in them to create a lush, diverse soil ecosystem for their cash crop the following year. Thus far all I have used is a rye/vetch mix (pictured), but I am hoping to experiment with annual clovers, oats, and buckwheat next year. Both heavy mulches and cover crops help mitigate the harsh winter conditions for the soil–if it is as mild as last year I could have active life for much of the winter. 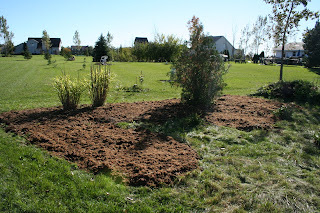 The plan is to save the mulched gardens for the spring plantings, and the cover crops for the May/June warm weather crops. On a separate, but very exciting note, the market garden will be trying an experiment in 4 season gardening. The owner has a 20′ hoop house on skids that we will be moving to cover two beds we are cutting this weekend to grow spinach, mache, and endive. He also has dozens of sheets of triple pane glass from a business that was to be demolished, so I intend to cover the beds with simple straw bale cold frames as well.